First and foremost, Happy New Year's Eve to all of our friends! Today, we are reflecting on our 2017. The year of course had its highs and lows, but we are thankful for so very much. We are thankful for each other, for our health, for Astrid's recovery after her toe amputation to remove a sarcoma, for all of our family and friends (like you! ), and for yet another year ahead of us. On this day of reflection, Eddy snapped a pensive selfie in remembrance of 2017. Of course, the Christmas tree had to make an appearance in Eddy's selfie! 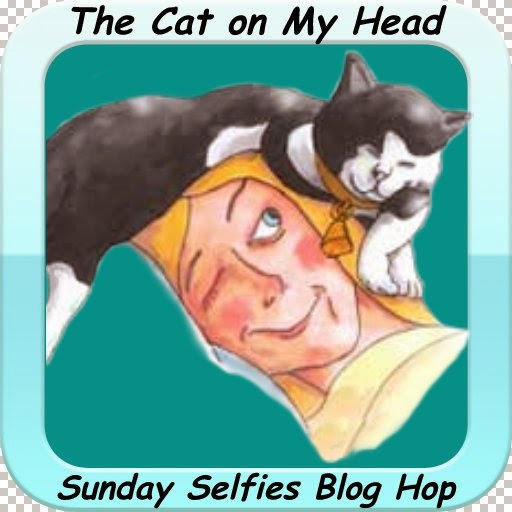 And, of course, this is our entry in the Sunday Selfies blog hop, hosted by the Kitties Blue over at The Cat on My Head. We are wishing each and every one of you a happy, blessed, and safe New Year's Eve! We'll see you next year! Keep in mind that in cold weather, animals outdoors will typically increase their food intake, since maintaining body heat in cold weather expends extra energy. So, if you feed outdoor animals, and if you would like to aid them in staying warm this winter, do consider giving them extra food this time of year. That being said, as we've mentioned before, when feeding animals outdoors, do keep in mind what types of food will be most accessible in cold weather. For example, moist food can freeze in cold temperatures, which is less likely to be a problem if extra dry food is fed. Also keep an eye on even your indoor/outdoor furbabies, or even indoor-only kitties or pups, as it is not impossible that they might need a bit extra food in the winter in order to maintain sufficient body heat. Of course, if you have any concern about the amount of food your furbaby requires in the winter, or any time of the year, do consult your veterinarian. We hope you're not tired of Christmas yet, because it's only the Sixth Day of Christmas, and we're not ready to say goodbye to the holiday just yet. 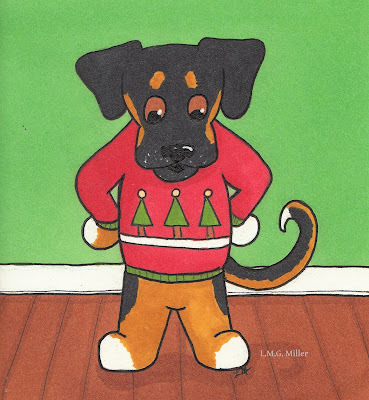 That's why we of course have yet another festive doodle to share with you today. Despite what that there doodle might suggest, my calico angel Rosie was never as bold or adventurous with the Christmas tree as Eddy. Rosie used to help me decorate the Christmas in the form of lots of snoopervision. She also loved to sleep under it. Who doesn't? Merry Sixth Day of Christmas, everybuddy! 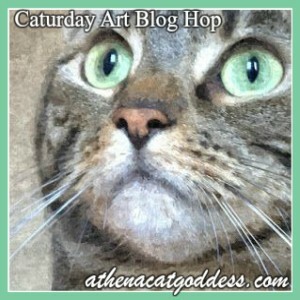 Oh, and of course this is our entry for Athena's Caturday Art blog hop! Yesterday we discussed ice melts and how they can have negative effects on our furbabies' paws and overall health. We mentioned wiping down those paws and perhaps even putting on booties as protection, and today we're adding one more tip on this topic. Applying something such as petroleum jelly, or another similar product for the paw, can help to protect paw pads from salt and other chemicals that might be found outside. What's more, a moisturizing product such as this can also help keep paw pads comfortable and overall healthy during this dry time of the year. Especially if your furbaby is prone to dry skin and dry paw pads, discuss this option with your veterinarian, so that your kitty or pup can enjoy cozy toes even during the winter. Keep in mind that some lotions or other similar products may not be safe for your kitty or pup, so do discuss safe options with your veterinarian. 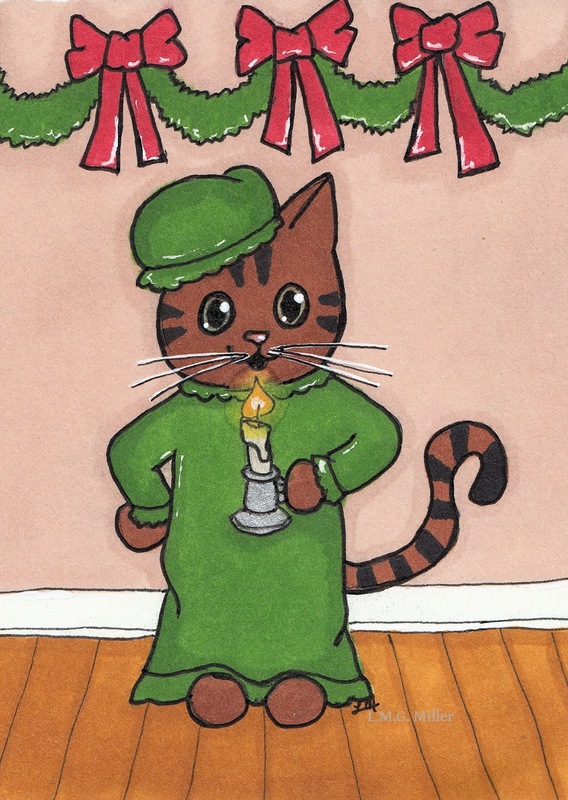 Merry Fifth Day of Christmas! Yes, we are still all shades of festive over here. That being said, can you believe it's the final Friday of 2017? This week's Friendly Fill-Ins, hosted by Ellen of 15andmeowing and Annie of McGuffy's Reader, are all about the New Year. See these fantastic fill-ins to help us ring in the New Year? 2. One goal I have for 2018 is _________. 3. In 2017, I accomplished _________. 4. I _________ in 2017. 1. On New Year's Eve, I always watch While You Were Sleeping with my family while waiting for the clock to strike midnight. 2. One goal I have for 2018 is to improve my blog visiting habits. 3. In 2017, I accomplished a lot of new kitchen hacks. 4. I am leaving all negativity in 2017. Can you guess what's up next on this festive Fifth Day of Christmas? Eddy, of course! Sometimes, very rarely, you'll catch Eddy under the tree rather than in it. Don't worry, though, she scaled the tree roughly half a second after this photo was taken. Oh, and for those who might have missed it in an earlier post, we can't easily have a tree skirt in this house, so that's why you see just plain and boring cardboard down there under our tree. Hind limb paralyzed Evan tends to get caught up in tree skirts and drags them around with him. That, or like last year, he just uses the tree skirt to drag the entire tree halfway across the room. With Eddy in it. Have yet another fun and festive Friday! This winter, keep in mind that many commercial ice melts, such as salts, can be potentially dangerous to your furbabies. They often contain components that can irritate skin or cause internal irritation if ingested, which makes for less-than-ideal conditions during walks outdoors during the winter. On your own driveway and sidewalks, use only pet-friendly ice melts, or use another harmless substrate to reduce slippery conditions. If your pup or kitty goes outdoors, always be sure to wipe down their paws and underside afterwards, especially if they've walked on other people's property, as you don't know what types of winter products they might have used. If your furbaby allows it, you can also put booties on their feet to protect them when they go outdoors. Also, remove or wipe down your own shoes upon arriving back home after being outdoors, so that you don't bring questionable materials into the home. Always be aware of where your furbaby's feet have been! Merry Fourth Day of Christmas, friends! We just can't let Christmas off the hook that easily, so we're keeping it going. First up for our festive day today, we are of course participating in the Thoroughly Poetic Thursday challenge, hosted by the ever handsome Angel Sammy and Teddy. I feel like my poems for these photos have thus far always been quite a stretch. When Angel Sammy, Teddy, and their Mom Pam shared this photo last week, they mentioned how perfect it would be for the upcoming New Year festivities. They are so right in that, yet my mind didn't head in that direction. I had all things Christmas and winter on my mind, and when I saw the picture, I thought of colorful snow falling rather than fireworks. What if snow was of a different hue? What if instead of white it fell royal blue? Would snow then lose its glory? Would it become nothing but boring? But have any other colors yet been discussed? I decided to put snow to the test. I simply had to know what color suited it best. And set myself to the task at hand. But upon the snowman it brought nothing but gloom. But, goodness me, the snowman simply looked too mean. And of that color I was not sure what to think. Now, let me tell you, don't go for red. That made the snowman look deader than dead. And instead gazed up into the overcast sky. What if snow of purple began to drift? Would that be a curse, or would it be a gift? Or lit the night in a fluorescent show? Or leave inky marks upon your nose? Cold and dazzling and shining bright. I decided, after all, that I quite like that sight. Snow of white brings merriment. And so that ended my experiment. What do you all think? Should snow stay pure and white like it's always been? 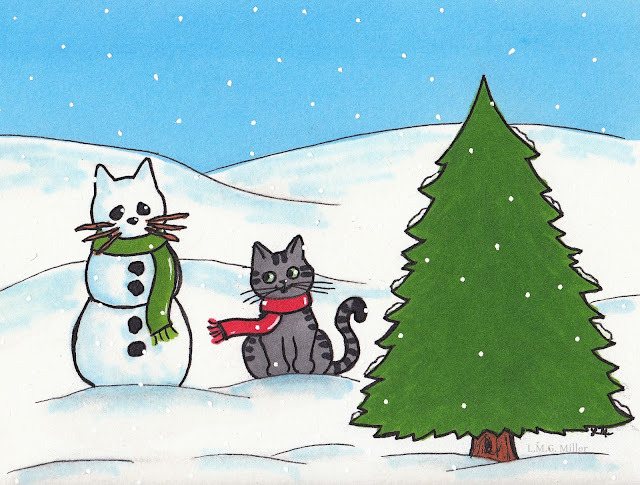 Can you imagine a snowkitty in blue, green, or pink? This kitty likes her snowkitty just the way it is. Of course, next up is Thimble. Like her mom here, Thimble was excited when, by some miracle, we woke up to a snowfall on the morning of Christmas Eve. We stayed warm inside, but enjoyed watching the snowflakes falling to the ground. Thimble did a little happy dance in honor of our white Christmas. We haven't had a white Christmas in years. I remember enjoying them many times as a child, but as I got older, Christmas always seemed to be warm and rainy. Not this year, though! And we still have all that snow on the ground! It's not like it could even begin to melt, though, with the subzero temperatures we're having these days. We've been throwing lots of extra food outdoors for the wildlife and of course any stray or feral kitties who might find themselves in our yard. We're entering our white Christmas joy into Brian's Thankful Thursday Blog Hop. On top of having a white Christmas, we are also so grateful for our warm home. Though we may find the snow festive and beautiful, it causes a rough life for some. We purr, bark, and pray every day that each and every soul could know a safe, warm, and cozy home. This time of year, and year round, you all certainly already know to keep antifreeze out of the reach of your furbabies, as it can be very toxic and even fatal to them. Also keep in mind, though, the safety of other critters. For example, don't leave antifreeze sitting outside where wildlife, strays, or ferals might reach it. Also keep in mind the potential for wanderers if you keep your antifreeze in the garage or shed, especially if you also leave those doors open for an extended period of time. An animal could perhaps make their way into your garage, shed, or anywhere you might place your antifreeze outside of the house and be poisoned if they consume it. 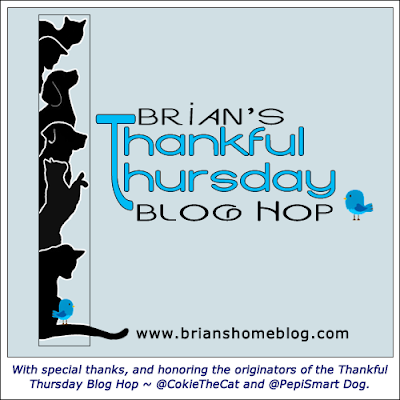 In this same line of thought, if your furbaby were to slip past you and make it into the garage, is the antifreeze or other dangerous substances hidden enough that your furbaby cannot reach it? For the safety of any and all critters, do consider keeping your antifreeze somewhere well out of reach, such as in a cabinet or bin in the garage. As always, it's better to be safe than sorry! Pup Astrid spent Christmas with one of her favorite people. And, yes, Astrid is wearing a Christmas sweater. I never thought I'd be one of those who put my pup in a sweater, but my sister found this incredibly festive Christmas sweater, and it fits Astrid like a glove. Yesterday we mentioned knowing how to recognize the symptoms of hypothermia this cold time of the year. Today, we have some tips on avoiding hypothermia in our furbabies. First and foremost, you can of course eliminate or reduce time in cold weather in order to prevent hypothermia or frostbite. Though dressing up furbabies is not something that everyone is accustomed to doing, for those furbabies who allow it, sweaters and booties can help reduce the loss of body heat and to keep paws warm and dry when they do go outdoors. For furbabies who spend longer time outdoors, or who perhaps live outdoors, as we have mentioned before, please do your best to provide them with a sheltered and warm area outdoors. Outdoor shelters can be bought or built, and substrate such as straw can be added for burrowing and staying warm. There are also outdoor-safe heating pads or heaters that can be added to outdoor shelters, and can be extremely beneficial in helping outdoor animals stay warm and safe. Whether a furbaby is indoor/outdoor or outdoor only, when they are outdoors, try to ensure that their cold weather environment is kept as dry as possible, as moisture can exacerbate the potential for hypothermia and frostbite. Try to keep outdoor shelters sufficiently covered and leak-proof, and therefore free from rain and snow. Cold weather can be dangerous for kitties and pups, so please do what you can to keep them warm and safe! Secret Santa Paws Came to Town! 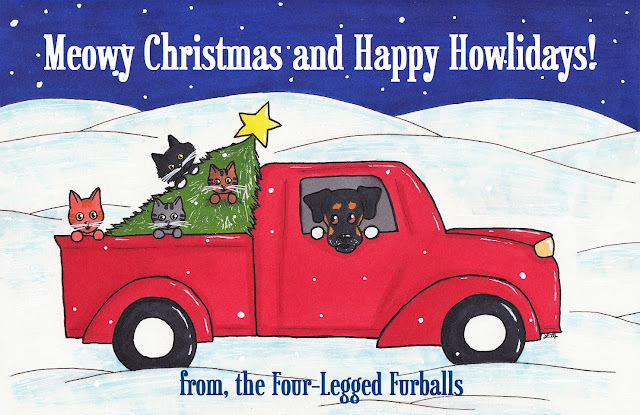 Today we are going to share with you just how marvelous our Secret Paws made our Christmas. And who is this Secret Santa Paws that made our Christmas so marvelous? Well, it was Marvelous, of course! Marvelous and his crew picked out some purrfectly fun and festive goodies for us. The kitties knew there was goodness to be had in that big box right away. There were so many gifts to be unwrapped, and so many kitties eagerly awaiting said gift unwrapping! So, we got to it. And what we found were gifts aplenty, all fun and festive and so very much appreciated. Isn't that little guy just so cute? Thimble especially loves this little guy. He's already been rescued from the land beneath the couch roughly a thousand times (that is, after all, where most of Thimble's victims end up). But he's totally worth it, he's so stinking cute! The goodies just kept coming, too. Those there jingly balls are some of our housemate Toby's favorite kinds of toys. He loves to scatter them all over the house! Look how cute this little polar bear pillow toy is! This here human almost snatched this one up for herself, to add to her festive decor, but decided to let the kitties keep it after all. Thimble thinks it's adorable, too! You can't go wrong with mousies! These guys are festive, too, not to mention so very fun to slap around. You know what else we got? Festive Temptations treats! We recently learned just how much mancat Evan loves these. He loves them so much, he'll knock them to the floor and help himself to the spillage. Next we found some crinkly toys! A festive wand toy! Thimble couldn't even wait for this here mom of hers to remove it from the packaging before she decided to have her way with it. Everything we'd opened at this point was so purrfect, and we could not have asked for anything more. But, more there was! The kitties had one more gift to open. It was big, and we couldn't have imagined what else a kitty could need with all the goodies we'd already opened. Then we opened it up, and all of us were so excited at what we found (this here human included!). It's a log cabin scratcher! We wasted no time in getting that box opened up. This human managed to use her opposable thumbs to get it assembled, with a little help from Management, of course. When we had it all put together, the new residents immediately started to move in. Not surprising, given the prime real estate that it is. Recognize that one there? It was our Sunday Selfie shot this week! And do you know what else magnificent Marvelous sent our way? Goodies for pup Astrid! Isn't this bear pup toy just so cute? All of us here, of course including Astrid, sure think so! And she even got some yummy treats. Look at those festive canine candy canes! We wish we had pictures of Astrid with her gifts, but we opened these goodies early in the morning, and Astrid is not a morning dog. She was still sleeping during this festive fun, the lazy pup. But, rest assured, she loves her gifts from Marvelous! And this human here got some delicious goodies, too! You sure can't go wrong with chocolate! Especially dark chocolate, which just so happens to be this human's favorite. Oh, and we have to show you the adorable card Marvelous and his Mom Barb sent us, too. Snowmen are a festive favorite around here, and foxes are one of this human's favorite animals (along with kitties and pups, of course! 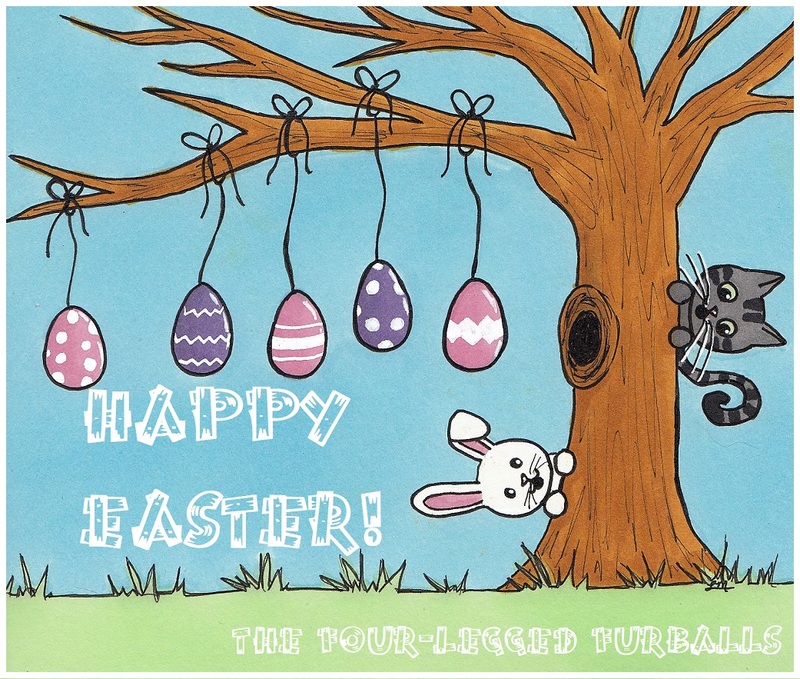 ), so this purrfect card made us smile big time! It is of course now hanging with the other beautiful Christmas cards we've received from our friends. This here human tried to get a shot of all of the goodies we received, to show you all a review of everything marvelous Marvelous sent our way. But, the kitties kept stealing their toys away and the group shot of the goodies was therefore a fail. Regardless, we cannot even express how much we love and appreciate every single thing Marvelous sent our way. Marvelous, thank you a gazillion times over for making our Christmas so marvelously fun and festive! 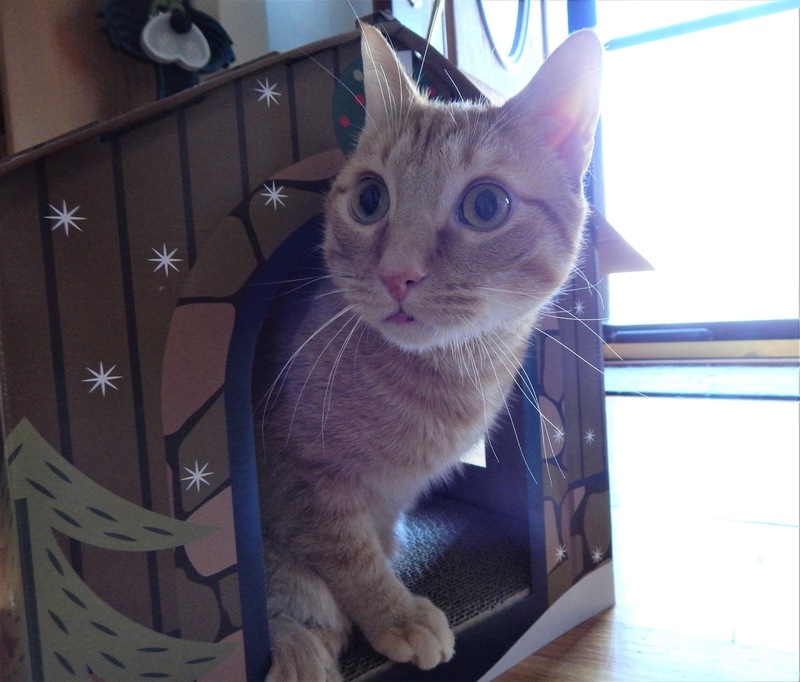 We could not have asked for a more purrfect Secret Paws! Around here, we don't just celebrate Christmas. We also celebrate the Twelve Days of Christmas. Thanks to the Twelve Days of Christmas, this festive season doesn't have to end on Christmas Day. After all, Christmas Day is only just the First Day of Christmas! That all being said, we will be continuing our festive fun with a Twelve Days of Christmas series of doodles. This time of year, many places have entered winter. It's often cold and sometimes snowing, and this can of course affect both ourselves and our furbabies. Especially for those furbabies who go outdoors, be sure that you know the signs of hypothermia (decreased body temperature). These signs of course include shivering, as well as lethargy and decreased alertness. Also be on the lookout for frostbite, which is evidenced by signs such as discoloration of extremities such as the paws, ears, and nose, as well as either pain or numbness in any of these areas. All of this is of course important to know for your own furbabies who go outdoors, but also for strays and ferals that you might see. If you find any furry critter that you believe might be suffering from hypothermia, please do what you can to help them. Even a call to animal control, or any organization who can help, could save the life of a furbaby found outdoors in the cold. Keep those furbabies warm this winter! 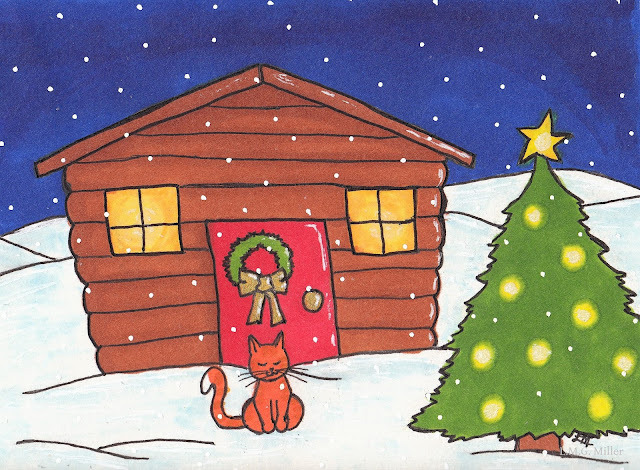 If you were part of this year's holiday card exchange, or if have watched the wonderful Cat Bloggers Holiday Slideshow created by Peaches, Paprika, and their mom Carol, then you might have already seen that there Christmas card that we doodled up this year. Regardless, we want to reiterate our message and wish each and every single one of you a Christmas, or any holiday you celebrate, that is merry and bright! We are again repeating a past tip. This Christmas, of course enjoy your holiday with your furbabies, but also keep their best interests in mind. 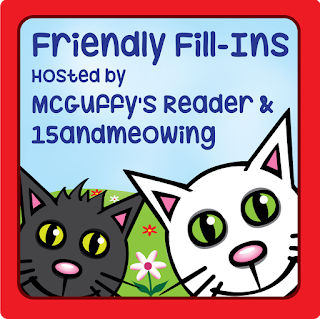 If you are having guests over for a gathering, ensure that your furbabies are safe and sound. Keep them away from the door so that no escapes can occur. If need be, put them in a room all of their own, which can help prevent not only escapes out the door, but also injuries from being in foot traffic, or from being inadvertently given dangerous food by unaware guests. In case an escape should occur, ensure that all furbabies are wearing identification prior to the festivities beginning, so that an escaped furbaby can have the best chance of making their way home. Again, you of course can enjoy a fun and festive holiday that includes your kitty or pup, but be sure that they are closely monitored or secluded as needed for their protection. 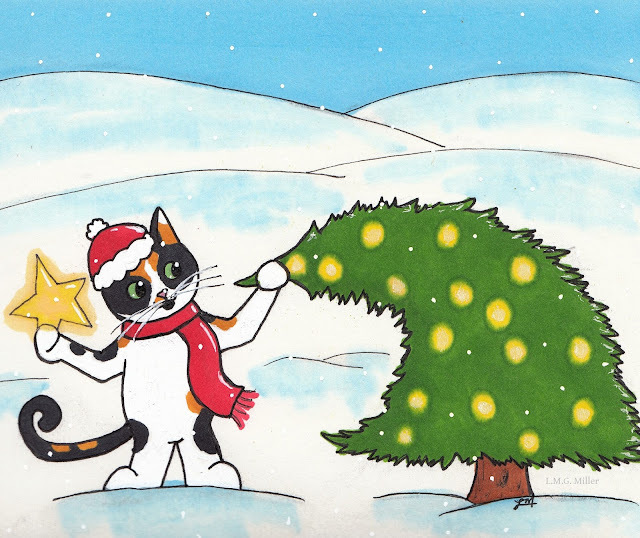 Have a merry and safe Christmas with your furbabies!